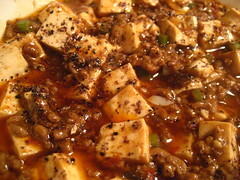 This is one of my favorite tofu recipes from China. It is easily the best known one: soft white cubes of tofu floating in an intense red chili oil sauce, with minced meat, spring onions and garlic and ginger. It has quite a funny name: 麻婆 mapo means pockmarked woman, and this woman with her bad-face-day is said to be the inventor of this Sichuan favorite, more than 200 years ago. Pockmarked or not, she sure was a kitchen princess! While the Official Dutch Bureau of Food has fried tofu in white wine sauce for their Christmas vegetarian meal (I shudder when I type this), I think you will bring out the best of tofu when its softness and bland flavour clashes with some true spicy stuff. Without trying to sound fussy, much depends on the kind of tofu you use. The spectacular result I had last time was really tofu-related. I will list the kinds of tofu for this dish in my preferred order. Try to get the top of the list, but don’t despair if it can’t find tofu number 1. For this dish I recommend: 1. Fresh soft tofu from the Asian store. I bought mine for a mere 0.39 cents (300 grams, rather small) This serves two people. 2. Japanese silken tofu in a carton. They come in red or blue packaging and have quite a long shelf life, but cost like €2.50. 3.Fresh normal tofu. These cakes are bigger than tofu no.1, but have a more coarse structure. 0.80cents. 4. supermarket tofu, packed in thick plastic packaging. Usually too coarse and its taste is not subtle. When your first bite of tofu ever was tofu no.4, you will probably be put off for life, but please try the better ones on the list, you won’t be dissapponted! For this dish you need: 50 to 100 grams of ground meat (pork or beef or mixed is OK), garlic, ginger, spring onions, Sichuan chili broad bean paste – tobanjiang or doubanjiang, soy, sugar, cornstarch, ground Sichuan pepper, sesame oil, and stock or water. Cut up the tofu in small cubes and soak in hot scalding water for 2 minutes. Meanwhile, pour a pool of oil in a wok and fry meat. Don’t skimp too much on the oil, because if it isn’t there, the end result won’t turn out so great. When the meat starts to brown, add 2 cloves of chopped garlic, 2 cms of chopped ginger and fry until fragrant. Add two tablespoons of tobanjiang (Sichuan chili broad bean paste. The best brand is from Pixian County, and called Pixian doubanjiang. Ask your shop. And keep asking. I know it’s for sale in Amsterdam, Rotterdam and The Hague). Stir until fragrant, add water or stock to make a sauce. Carefully, add the tofu cubes and stir to coat the cubes with the sauce. It will smell delicious already! Simmer for a couple of minutes and add half a teaspoon of sugar. Meanwhile, chop up 2 small spring onions into small rings. Prepare the Sichuan pepper powder: fry two tablespoons of Sichuan pepper (huajiao) in a dry pan until fragrant. Let cool and grind into a powder. You can use your stone mortar for this, it’s fun! In the end of the cooking, dissolve one tablespoon of cornstarch into half a cup of water. Use this water to thicken the sauce, first add half of it and see how thick it gets, add more if needed. If everything is to your liking, put all on a pretty plate, sprinkle on some sesame oil drops, scatter over the spring onions and the finely ground Sichuan pepper and … enjoy.